NEW YORK -- A large hammock fell from a Lower Manhattan building and crashed onto a tourist on the sidewalk Tuesday, and a day later, questions were mounting about whether it all should have been prevented. CBS New York spoke with the Department of Buildings on Wednesday. Being knocked to the ground by a long hammock with a wooden base was certainly not on a 48-year-old woman from the United Kingdom’s list of things to experience while touring New York City. But that was exactly what happened to the woman as she walked in downtown Manhattan with her husband during heavy rains and wind at 5 p.m. Tuesday. 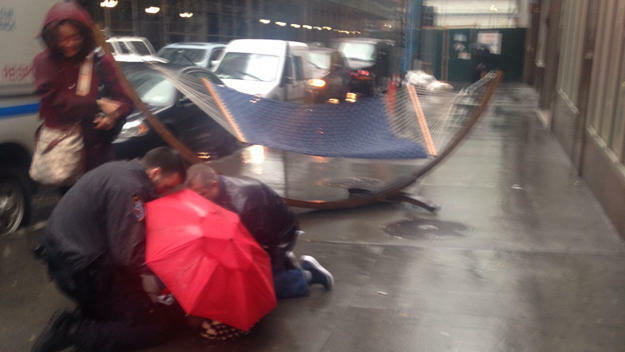 The hammock fell 50 feet from the TriBeCa House residential building. The woman, helped by strangers on scene, was taken to a local hospital by ambulance and suffered a head injury. The Department of Buildings (DOB) said its help was not requested. “When the Police Department, Fire Department got there, they did not request our assistance,” said Timothy Hogan of the Department of Buildings. Hogan told CBS New York the department usually get alerts from the Office of Emergency Management and the National Weather Service when winds are expected to be more than 30 miles per hour. The DOB, in turn, alerts building owners to make sure all furniture and other items are secure. On Tuesday, there was no such warning. Even though it was reported that the wind speed was less than 30 mph, Hogan said that is not always accurate in big cities like New York. Big buildings can cause a tunneling effect, increasing wind speeds. “Looking back, again, at some of the reports, there was some wind tunneling effects that were going on around the city in different areas,” Hogan said. He said in those cases, it is better to be safe than sorry when keeping furniture and other items outside. “If you’re not properly securing that and you’re just putting it on the deck saying, ‘Well, I’ll worry when the wind comes,’ you probably won’t be home when that wind event occurs, and you endanger yourself and the public,” Hogan said. Hogan said it is ultimately the building owner’s responsibility to make sure all tenants comply. In some cases, the owners can face fines from $10,000 to $25,000. CBS New York stopped by the TriBeCa House asking the owner for a comment. There was no call or email back as of the late afternoon Wednesday. Police are treating the incident as an accident.